Okay. I'm going to try and explain, from the inside, how Boston feels about The Wahlbergs. They are the acting "dynasty" that now comprises Academy Award-Nominated Caucasian Rapper Mark, Boy Band Heartthrob turned That Nice Boy on Your Grandma's Favorite TV Show Donnie and now Chef Paul, proprietor of area restaurant/reality-TV setting Wahlburgers. Get it? Because a part of their name kind of sounds like part of the word "burger," y'see? Boston (here a word meaning "the entirety of New England," because reasons) loves its native sons. Actually, Boston loves its native anything - as The Onion once perfectly summarized, Boston is a perfectly nice mid-sized city that likes to think of itself as a NY/LA-level megalopolis and is just belligerent enough about it that the rest of the country is mostly content to allow us our illusions. And so too do we love The Wahlbergs, in no small part because they (Mark in particular) embody the city's idealized self-image: Snot-nosed blue-collar punks who can conquer the world while still peacocking a certain degree of old habits thuggery like a favorite t-shirt. Wahlburgers, now heading for a second season, is built on the assumption that this dynamic can be successfully translated to audiences nationwide - well, that and the spectacle of Mark Wahlberg either not caring or not grasping (it's hard to tell) that he's too much of a legit movie-star to be doing a "Famous Guy's Wacky Family" reality show. Reality TV is all about editing real situations into sitcom premises, and the half-real premise of "Wahlburgers" is no exception. 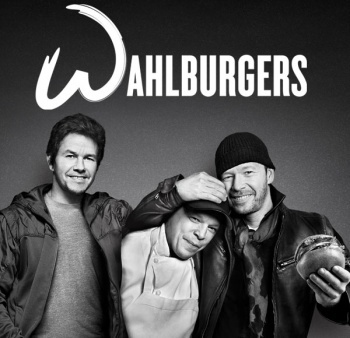 Homey, unassuming Paul (standing together, the Brothers Wahlberg look like a character study of a normal person gradually evolving into a Hollywood person) operates an upscale burger bar, which is stressful enough except his principal investors are his movie/TV star brothers!